I have been working more on AIS time. In the process, I pushed gnuplot over the edge. I have been successfully using gnuplot since 1996, but it is not the most flexible plotting program. 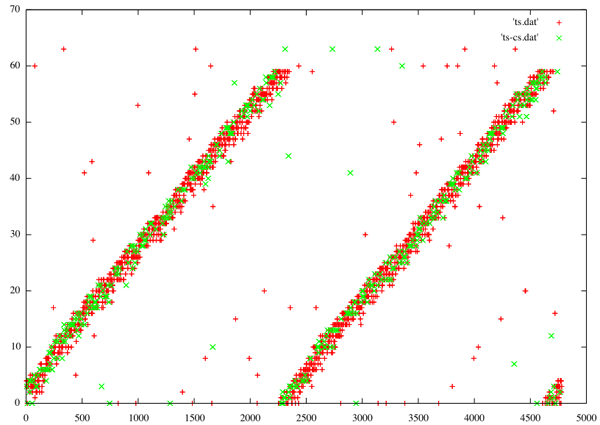 I'm forcing myself to use matplotlib and not slide back into gnuplot. Here is my latest attempt with matplotlib. I've cheated a bit and used photoshop to add labels to this plot, but it is great to be able to add plots with different y-axes on the same graph/subplot. I have my copies of Mac OSX 10.6 on order, but I am bummed by the lack of proper support Apple is giving X11. X11 is the number one application on the Mac that I use. I also saw that PPC support has gone away. I wonder if old PPC applications will still run. Hopefully this will all shake out quickly with good results. I am looking forward to 64-bit fink, but wonder how many of the packages I use on a daily basis will require serious effort to get back working. I won't have time to really dig into this, but I have to wonder how this impacts the definition of primary stations used for hydrographic surveying. 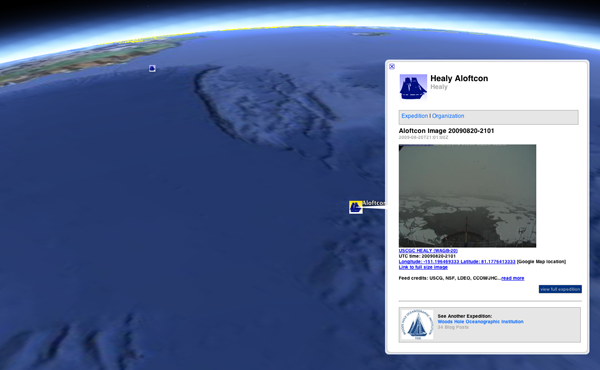 The USCGC Healy ice breaker is now in Google Oceans. This is my second contribution to the content available directly in Google Earth. Google is pulling from my GeoRSS feed of the Aloftcon. First you have to enable the layer. Here is my version of the Healy Aloftcon tracks. ifconfig will tell you the MAC addresses of your ethernet, wifi, and blue network interfaces. And the kitchen sink of harward info ... try this one without the "|head" and be prepaired for many pages of info. For updating hardware inventories for our IT team, I do this. Maybe I should add a few like the warrenty info. How hard is the machine working and when was it last rebooted? List open ports visible on the machine locally (not blocked by the outward facing firewall) and the versions. I have hidden some of the less interesting lines. What is taking all my cpu? SharedLibs: num =    9, resident =   87M code, 2944K data, 5224K linkedit. MemRegions: num = 14597, resident =  553M +   33M private,  364M shared. PhysMem:  598M wired, 1413M active,  207M inactive, 2225M used, 1871M free. Thanks to Alexander Hanson for triggering this post by mentioning sw_ver and xcodebuild that I didn't know. I think that's enough for now. sysctl hw.ncpu # Name a specific variable and get the results (here number of cpus. The last release of noaadata contained ais_nmea_remove_duplicates that I talked about a couple weeks ago. This program kept a running list of packets and used the NMEA data payload string has a hash. That was nice in that it dropped the data volume down as early in the process as possible. However, with the timing issue, I want to keep the duplicate packets around. This will allow me to compute the USCG timestamp skew, which is non-monotonic and jumpy. More importantly, when I have my time sense figured out with my new algorithms, I should be able to compare each receivers sense of time. Hopefully, I can then put together the best possible set of position reports and time for each vessel. ais_build_sqlite now has a new class called "TrackDuplicates". It keeps a queue of recent packets. The list is constrained both by length and time. If I know that my time source is good to a couple minutes, I can constrain the queue to be 5 minutes and I should be able to catch all of the duplicate packets. When a new packet is received, it is assigned a pkt_id. When any additional duplicate packets come in, the tracker will return a duplicate indicator and the pkt_id of the original packet. I keep the pkt_id unique across all of the message types so that I can keep things in order for time analysis that includes both basestations and class A transceivers. Here are the new columns in the database. Currently, I only check messages 1-4. Colleen has just released the CCOM/JHC flickr photostream. 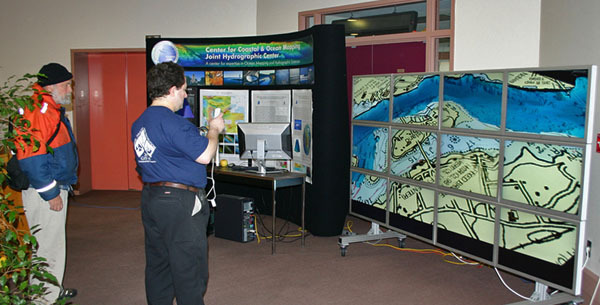 It has some gems like this image of the CCOM tiled display showing Portsmouth, NH in GeoZui being controlled with the WiiMote (hats off to Roland for putting this together for a UNH GIS Day Event). Thanks to Colleen for pointing me to the feed. Here is my attempt at an algorithm to find the time outliers in a stream of packets. The goal is to throw out packets where the sense of time is corrupted. This is the same Boston area data that has one ship that completely looses its sense of time that I showed a few days ago. First some results. Red x's for points that were rejected, green +'s for points that I kept. This is only the points where I have the commstate for positions or valid basestation reports. 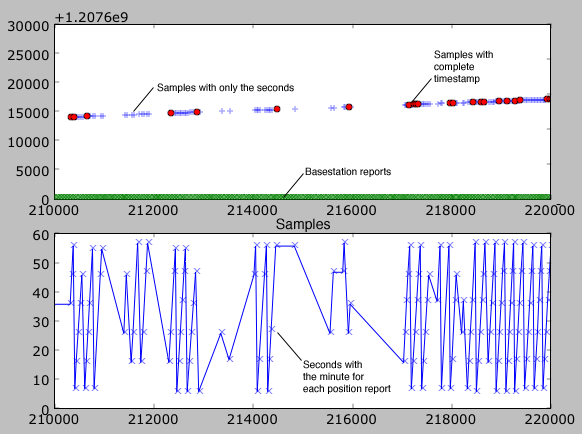 Zooming in to a window of about 400 second period of time shows how the algorithm does a pretty good job removing packets that are close, but not quite on the general time curve. 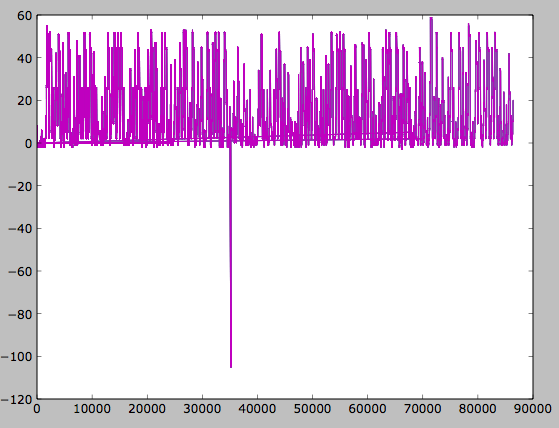 It looks like I have one time record that I should have removed, but I think that will go away with some tuning. Go through all the point and mark as invalid any time that is more than minutes away from the timestamp. I have seen errors of up to 80 seconds in the datalogging systems timestamping. From here on forward, I only consider packets that have not already been flagged as invalid. I then walk the data in order received from one station. Look back over the last N points. These should be all have times that are older. Stop looking at packets when they are more than 60 seconds older than the current packet. Count how many are newer than a buffer time (using 10 seconds now). If I get more than a critical number of future packets, then I flag the point as invalid. I then flip this around and look forward. This is a bit more risky. An unflagged bad point could stop my search before I realize that it is bad by triggering the search to stop by being too far in the future. Packets ahead in the stream (received in a later slot) should have newer times. If we see too many old packets, then this packet thinks it is newer than it really is. I am wondering if I should look backwards across the whole data set first, rather alternating looking backward and forward. Right now, I only look at the next 10 valid points in each direction and clip this if the data is too sparse in time; I only scan up to 200 received messages out and up to 60 seconds. 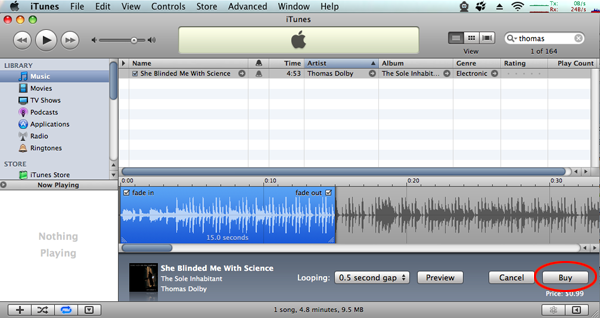 With the 10 second delta time parameter, that gives me 4 degrees of freedom to tune. Here is a quick illustration of looking to either side in the data. They show the direction in which they were found to be bad. This month's Digital Ship has an article about Space-based AIS (S-AIS). The article focuses on COM-DEV International's exactEarth subsidiary and their exactAIS product. I haven't seen any data from COM DEV to be able to judge the system. Then end goal is apparently is total of 6 small satellites. I've been working on how best to produce a sense of time for received AIS messages where the time stamps on the receiver either do not exist or are untrustworthy. One thing that I assume for an individual receiver is that the messages come out of the receiver in the same order that they came out of the VHF Data Link (VHF). 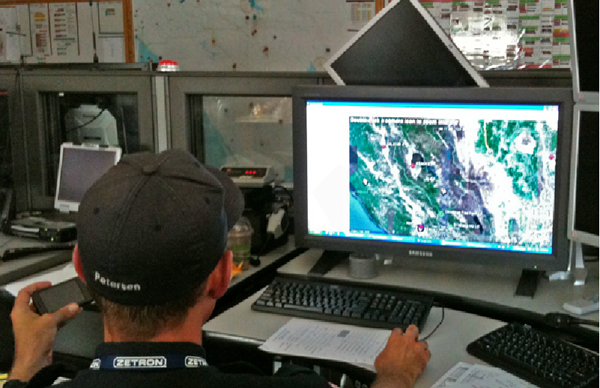 AIS Class A position messages all send their sense of the seconds of the minute from the vessel's GPS. If the vessel is operating in SOTDMA mode, every 8th packet should also include the hour and minutes. Reporting that you don't know is a perfectly valid thing to do. Reporting that you know, but you really don't know, is a "bad thing." With that promissing picture, I took a look at one receiver in the Boston area. This receiver can't hear downtown boston, so it doesn't have that many ships. Here is 10000 samples from the receiver. You can clearly see the minutes ticking over. 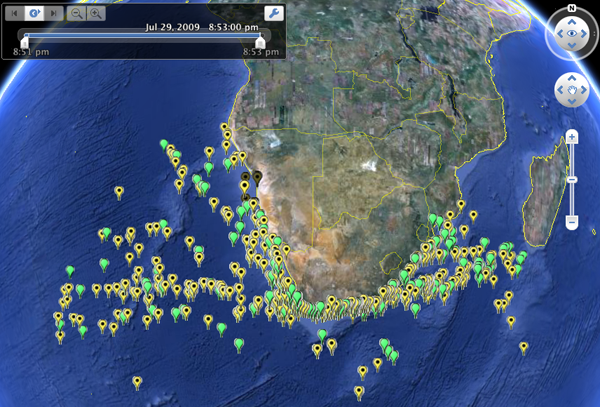 You can also see the slope of the lines changes as the number of reported vessels changes. 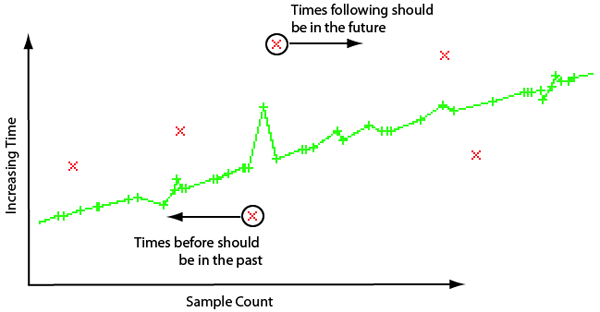 More vessels gives a lower slope, as the x-axis is number of samples (not time). Looking closer, we can see that there are two trails of time that are offset by about 10 seconds. I tried to come up with reasonable ways to keep track of when the minutes tick over. Then if I assume that this ship is reporting its position with a proper second with a transmission delay, I can generate a valid time for each report. I took a running average that is 60% of the average samples per minute. I can calculate this because I know I am looking at 24 hours of data (+/- a couple minutes). In the next two plots (just with different vertical stretches), I have plotted the window average and std deviation. The peak of the running average is right before the beginning of seeing ships with the next minute. This is likely an early best estimate of the minute transition. A likely better match would be the peak of the standard deviation, but we have to look back 1/2 the window size to get the sample that best matches the transition. This will only work if there is a roughly consistent number of ships. A rapid change in number of ships will throw this off. There is a very strange separation of time in the middle of the minute, where this time seems to separate. I am not sure yet what is going on. Slight different picks of the transiotion to show how things line up. Thanks to Maria, Matt, Monica, and Tom for suggestions on how to look at this data. 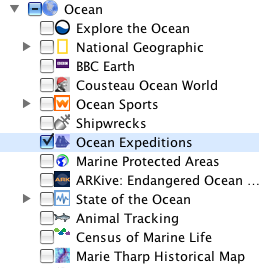 marine resources, according to the department. 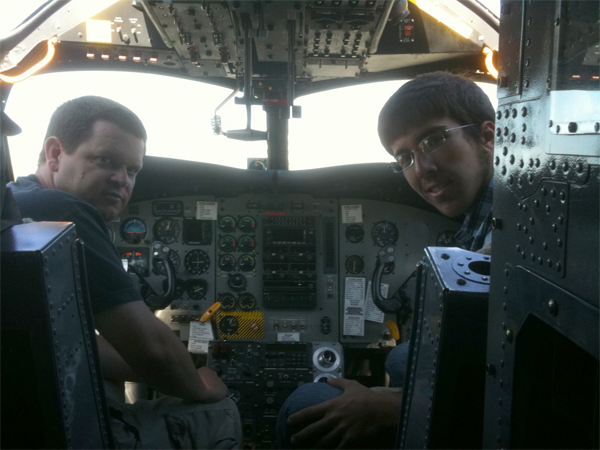 Last week, I wrote a guest blog post for the NASA Ames GeoCam. It's up on their GeoCam / DisasterCam blog. I visited Ames to collaborate on coding and to see about using the Google Phone for passing realtime information with NOAA disaster response groups (e.g. ERMA) and to give out whale position notices. Jim Gardner here at CCOM and the crew of the NOAA Okeanos Explorer recently discovered a large gas plume in the water column off of northern California. 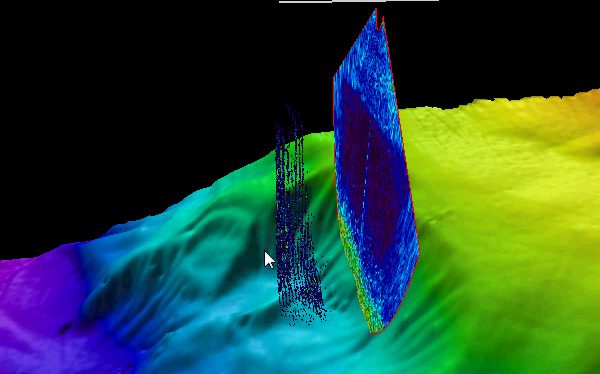 More weight to the argument that collecting full water column data with multibeam sonars can be really important. Last week, I took my first look at Space-based AIS (S-AIS). 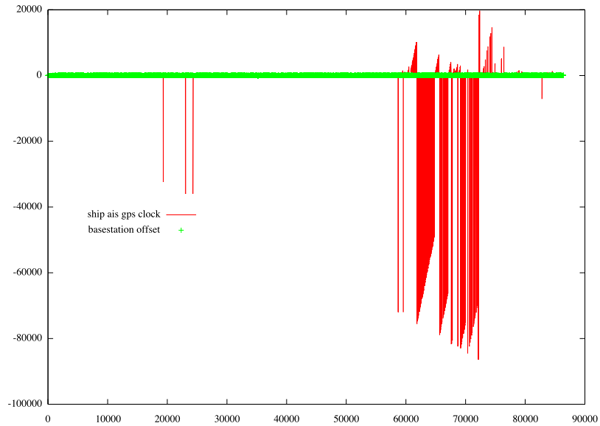 For this quick visualization, I used 2 minutes of data from SpaceQuest's two AprizeSat receivers. In two minutes, they collected about 7000 class A position reports with up to 22 reports from each ship and a total of 121 unique MMSIs. Nice! SpaceQuest just presented these results at TExAS III. USCG T flag time base means what? I was looking to use the USCG "T" metadata field to help check the validity of the sense of time for an AIS messages, but then I ran into this triplet of basestation report receives. This is the same message received at 3 receivers in the Boston area. "T" is supposed to be the receive time seconds within the UTC minute. I dropped that section of messages in a SQLite db to take a look at what is going on. I will abbreviate station names by the last two digits... 45, 46, and 47. It looks like station 45 timestamped the the packet as 1 second after it was sent. That's pretty good. However the receiver generated the T as 9 seconds earlier than the station timestamp and 8 seconds before the basestation thinks it generated the message. This looks like the receiver doesn't have a good sense of time. Looking at station 47 next, things totally come apart. 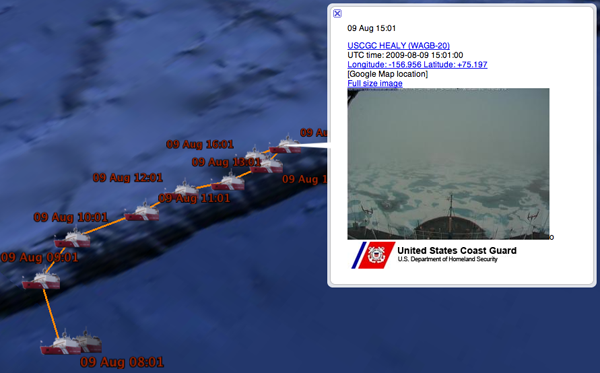 The USCG timestamp is 24 seconds before the basestation thinks it sent the message and the T receive time is either 38 or 22 seconds off (assuming that the it is less than one minute off. Taking a look at the comm state of a SOTDMA Class A position report in that batch of data, it shows that things for station 45 are at least consistant. There doesn't appear to be a way to track the receivers' GPS locks so that I can know when to trust the T field. The shipandcargo field in AIS message 5 (shipdata or "static" ship data) mixes the type of ship and what it is doing. This makes it sometimes impossible to pull a class of vessel. We can use the message 5 to narrow down the possibilities. Over the past week, I have been trying to figure out how to come up with the best list of ferry vessels in the US and Canada (including the Great Lakes). I know I will miss those in places like Lake Tahoe and ships like the Mt Washington in Lake Winnipesaukee. But this is the best I have come up with so far. (I'm leaving out any ferries that might be using Class B AIS). Not that I started with 94118 message 5 lines. I'm seeing about 1.3% of the messages being undecodable receives of the wrong message length. Now I can start doing SQL queries to pull apart the data. The first route is to look for self declared high speed craft or passenger vessels. Ferries, like the Cat, can be either a passenger (60-69) or highspeed (40) craft, but not both in a message 5. The LEFT JOIN is critical as some of the vessels do not have matching entries in the MMSI prefix table. 235762000,"QUEEN MARY 2        ","GBQM   ",9241061,60,345,41,"United Kingdom"
Vessels with bad MMSI settings in their transcievers must be discarded. In the position reports, the MMSI is the only distinguishing value, so we will be unable to tell them from other vessels with that same error. 338116000,B AP3D P AP,SD U<P4,9265809,40,36,14,"United States"
Some of these are clearly cruise ships and other vessels that are really not ferries. It takes extra work to get down from 490 vessels to the true set of ferry vessels. There are many sources of time in AIS and not all source of time are created equal. Here I am comparing the USCG timestamps to the basestation reported time and ship's time reported in the position report communication state for 3 stations in the Boston area. Most users of AIS are using it for real-time collision avoidance, so they are not concerned as concerned with timestamping. 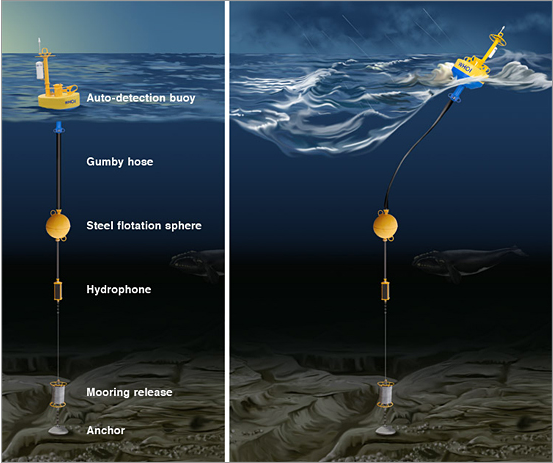 However, we would like to know that exact time that ships approach hydrophones in the area. First a graph of a while day. On the x-axis is seconds from the beginning of the data, while the y-axes is the difference between the time source and the N-AIS timestamps. 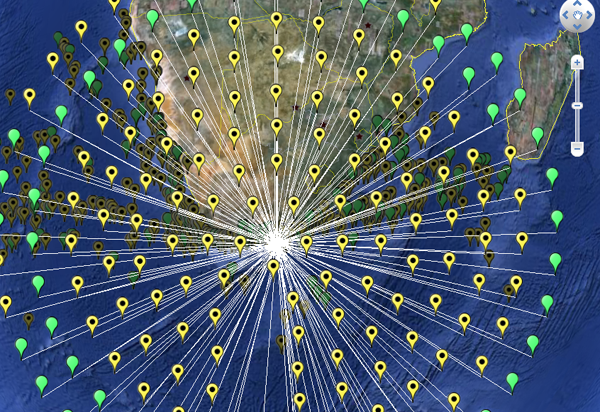 Overall, the 2 base stations agree with the timestamps recorded by the N-AIS stations within about 60 seconds (the thick green line of points near 0 seconds). For the most part, the clocks for all the ships in the area are equally close to the N-AIS time and not visible behind the mass of green. However, late in the day, there appears to be a lot of reports of ships' time being very far off from N-AIS. Turns out this is primarily just one ship having issues: CMA CGM ELBE. There is no way to know why it is off by up to 80000 seconds. If anyone knows what type of AIS transceiver they have and what likely went wrong, I would really like to know. 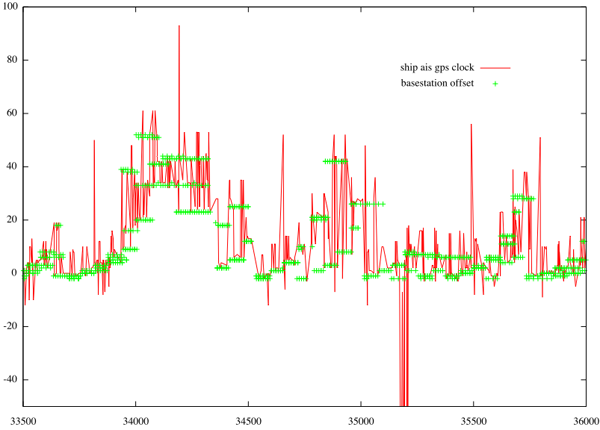 Here we can see that, in general, the ships' time and basestation time is tracking pretty well. Perhaps some of the crew has been away from land too long. Scientific graffiti? Since I keep needing this, here is my database cheat sheet for AIS Class A position messages. Note that this does not match what ais_build_sqlite.py creates right now, but it's close. In addition to additional fields, I'm ditching DECIMAL for REAL. keep_flag INTEGER,		-- ITDMA:  1 means keep the slot allocated for an additional frame. slots_to_allocate INTEGER,	-- ITDMA:  Slots to allocate. cg_s_slotnum INTEGER,		-- 'S' Slot number of receive. 9999 means? In python, the syntax is a bit different, but is easier to read if you are not used to it. Conditionals make it easy to do GNU autoconf configure like reporting of tests (or unittest with verbose mode in python). moving within either of the safety zones. 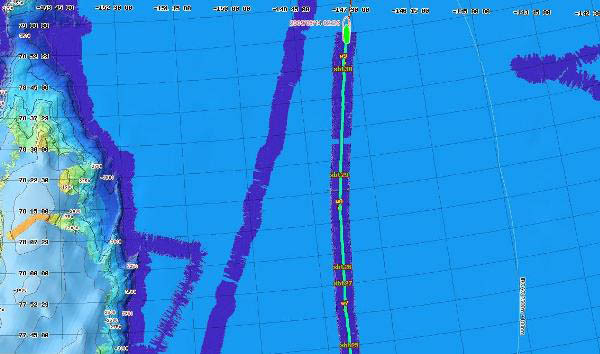 Some example images from the team work going on between US and Canada for joint operations doing both seismic profiling and multibeam data collection. The USGS also has a cruise blog with an RSS feed that contains many of the same posts as what is at CCOM. Meanwhile, the rest of us CCOM are back in NH with 90° F and humid weather. The whole binary message creation process is suffering from the lack of a well thought out guide to creating messages that work well. I was mostly focusing on what I have to decode and hadn't been thinking about how things were going across the network. This means I had not though about bit stuffing. So for safety, the unvailables should be 0 (zero) if possible. Otherwise, here are the values that work for the high end. A training 1 will likely cause the next high value to generate a bit-stuff event. Here is a table of possible default/unknown values. The whole point to try to keep as many messages as possible to just 1 slot. I wonder when this will cause more confusion than help. Basically, I tried to keep no more than 4 ones in a row and make sure it is okay if you have two of these unknowns in a row. 17:19 became 2:45. Not bad speedup. The compressed file sizes are not quite the same. I uncompressed the file that I compress with pbzip2 using bzip2 to make sure there is no loss or incompatibility and it checks out with the original using cmp. For now, I'm going to stick with bzip2 for my critical data, but if I have to move fast, I might go for pbzip2. 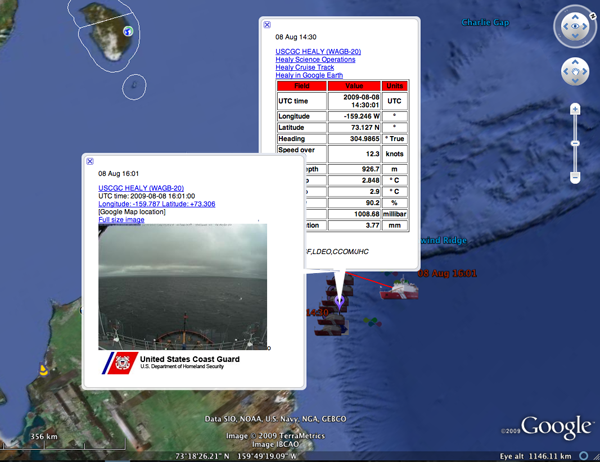 Where is the AIS tracking info on the missing ship? Finding the path of the ship and what happened when up to the point where it left European waters, should be easy... just pull the AIS logs from one of the several tracking networks. I don't get why they don't know. I do this all the time for US waters. routine, said Mark Clark of Britain's Maritime and Coastguard Agency. but there was no contact. - an area nearly twice the size of Chicago. 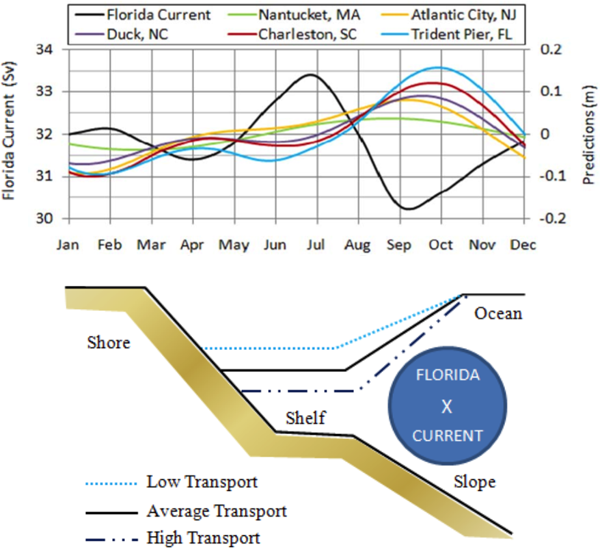 assessing the impacts of climate change, among other uses." Trey and I are working to get some stuff packaged for Ubuntu. What follows is not totally perfect. If anyone has corrections or suggestions, please email me! We started from the Ubuntu Hands On Packaging Guide. My initial attempt at packaging something focus on OpenLayers and I used jquery/1.2.6-2ubuntu1 as a guide. Now, pull down the source debian for jquery. The dget and apt-get source command appear to be the same, except dget pulls a particular version. Now that we have the two examples, it's time to get going on openlayers. Openlayers is a pretty simple package (but not as simple as jquery). We need to adjust the makefile in the debian directory named rules. OpenLayers needs to construct a "minified" library, so the build rule has to go into the build directory that comes with OpenLayers and run the build python script. However, this leaves python compiled files (pyc). These cause the debian create process to be unhappy. The next file to modify in the debian directory is the control file. released under a BSD-style License. In the control file, the blank line matters, the long description must be indented, and there must be a new line at the end of the file. The debian directory really does have to be inside the unpacked source tree. Now we are ready to build the file. This builds a binary deb that we can install in a moment. First we want to build the source debian. At this point we tried to test the package with pbuilder in it's own little space but never succeeded. 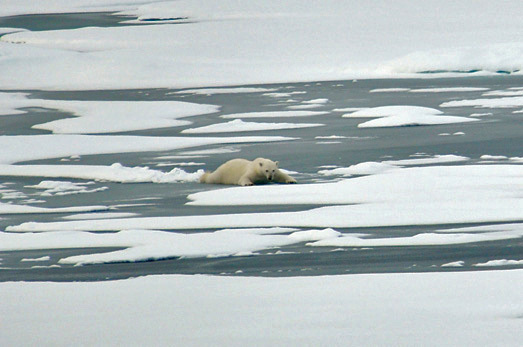 2009, while on a scientific research mission in the Arctic Ocean. And the Healy has met up with the Louis St. Laurent. and more than likely built in isolation. their attention on taking the technology forward. I have to say that attempts like this are actually common. Just one case in point is CLARAty [JPL] that was a colaboration of several NASA centers and universities. From Trey: "It is important that young people not understand how difficult things are." Basically... just go for it. If you want total control over an environment, then you need to have your own personal package managed area. I prefer debian to rpm in general, so Trey and I are looking at building a small debian world on top of MacOS, Ubuntu, and Windows Cygwin. The goal is to layer this over say fink in MacOS and then we can do exactly what we want without impacting fink. This should even work on an RPM distribution. How to start? Build dpkg of course. Since I am a fink contributor, I'll use that as the starting point. I will be using exactly the same version of dpkg (1.10.21) to make sure the patch will work without a hitch. First, I copied the source from fink. I'm going to try to keep things simple than fink and use gettext from my path (aka from fink). Therefore, I needed to remove the first two entries in the dpkg.patch that are for get text. Use your favorite editor here (emacs, right?). This fails with a ranlib error on the archive. Eh? make # Seems to then work? Will this blow up later? And then I can build a deb of it and get dpkg to self install the deb of dpkg. 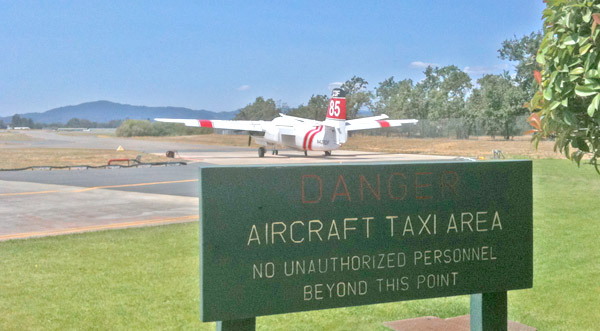 Excellent video of air drop of fire retardant from last week. and basically cover maritime security applications. possibly serve as a 'gap-filler' between AIS and LRIT. 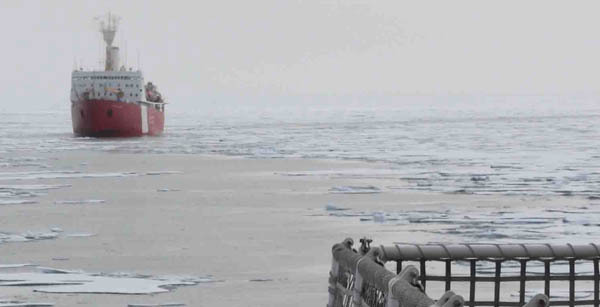 The Healy has found sea ice... I see from their track that they are moving off in a different direction. Just heard that this year, the team got out to the Healy via a landing craft rather than the normal helocopter ride. This is almost an RFC822 message. I just need to remove that first line that is the message size(right?). All this because I use Thunderbird and don't want to open mail or to email notes to myself. 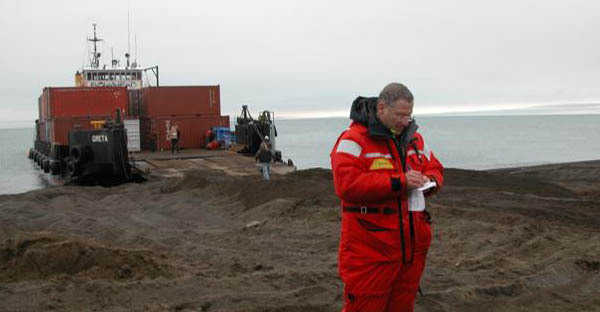 Last week, the CCOM/JHC science team for the Healy packed up and traveled up to Barrow Alaska. 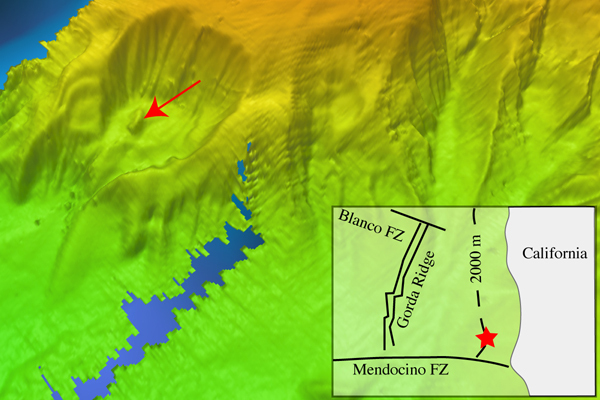 They are now on the Healy and steaming north for more sea floor mapping. from August 7 through September 16. Yesterday, I visited Cal Fire Sonoma air attack station and the Cal Fire Napa command station with Trey and Alex R. Both teams were supper hosts! I mentioned the idea of controlling an AUV via an iPhone before. I appreciated his discussion of GeoRSS. I hadn't looked at RDF and was seeing it being used as a serialization format. Now I know. readers, except perhaps limited support in FriendFeed. The iPhone camera is okay, but this shows that even a super cheap point and shoot with a real lense would have done better. Yesterday, I got my first sight of Niagra Falls. We were at 36000 feet. The tall ships are coming into Portsmouth, NH this weekend. It will be crowded, but worth it to see them. Too bad I will be missing them. Island, law enforcement officials said Wednesday. Best practices for AIS message creation? ROV Code of Practice - What about AUV's? I remember making checklists for the NASA Ames Telepresence ROV (TROV) back in 1992. We always seemed to be learning things the hard way. tools packages in use within this fast-developing industry. Via the Art T. news network... a presentation at the Scripps Aquarium. Building scientific instruments and lots of other stuff. This is going to be a big shift of a lot of people I know. It's painful to be on the phone with technicians that can only use a playbook and can't think through a problem. 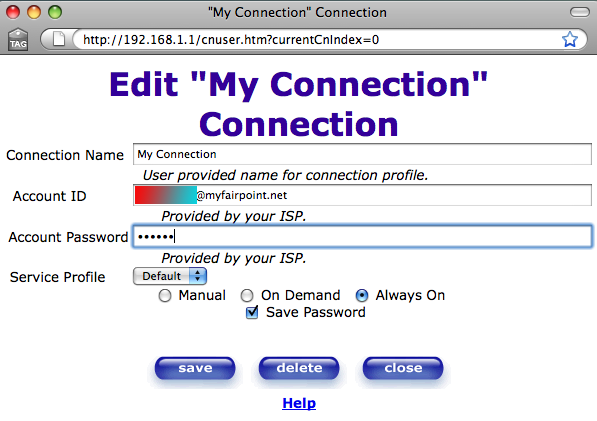 My DSL line with Fairpoint has been getting flaky over the last few weeks. In the past, when I had trouble, they looked at the signal level and had to adjust the speed down for a while to get a reliable connection. Things got better for a while, but now is was unusable. I called the tech and I asked if he could check the logs to look at all the drops. He said he can't look at any technical details. He could only see if I was connected or not. He then proceeded to push me through reseting the modem and re-entering the user and password for fairpoint. How does intermittent connection equal wrong username and password? He never once had me look at the Westel's troubleshooting tools. 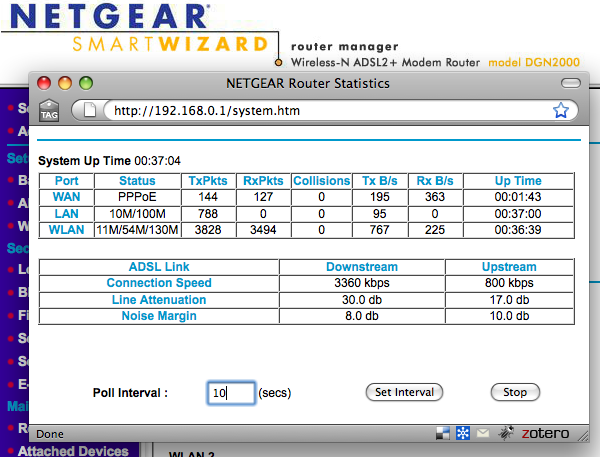 I think it's the westel, so I went and got a Netgear DGN2000 with builting wifi and DSL. That seems to be doing well and does an okay job of showing me what is up with the connection. I think I will stick with the netgear device. What should these numbers be? This just shouldn't be allowed. I've purchased music on CD and ripped it into iTunes. I thought I would just quick make a ring tone. But no! It says I can only make ring tones from music that is purchased from the iTunes store. Since I didn't want to repurchase a song that I already bought, I went and got my first song from the iTunes store. I made sure it had the bell next to it for a ring tone. Once I had the song in my iTunes library, I asked iTunes to make a ring tone and it asked me to pay another $1. What? I've already payed for the song. Forget that. I have sound files that I've recorded myself. I own the copyright. This means that I can't make ring tones of audio that I have the total rights to. Ridiculous! I refuse to keep paying for this kind of thing. I own hundreds of CDs. I like supporting artists and I'll buy the CD and go to concerts, but not this. I support the concept of copyrights for works, but not this kind of thing and what amazing things would happen if copyrights expired after 25 or 30 years! '''Data streams from GPS, AIS, and other sensors. filenames = ['*.ais',] # And? You can see that this test file with partial metadata on the 2nd to last line causes something to go wrong with the last line. Hopefully, the community can improve upon this start. And yes, I used kodos to help me debug my typos in the regex's. I should know enough by now to not be surprised by things like this, but I am. I was running checks on my decimation algorithm. Using just one receiver and only position messages, I should see very few removed messages (or none). I got way more than I expected: 108 messages (0.12%). While looking at the messages, I saw very unexpected behavior. 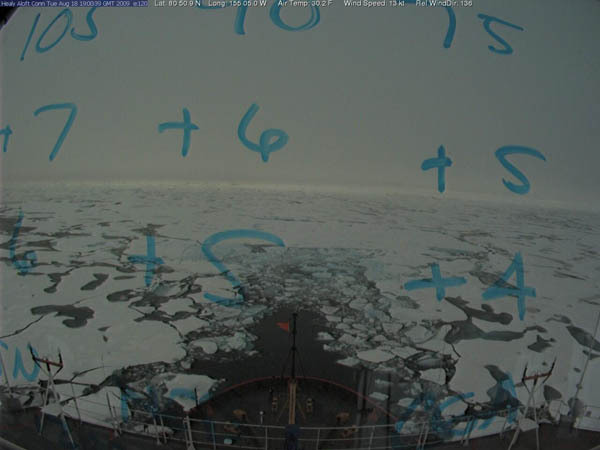 Most of these messages are from one vessel and are retransmissions of the same position message on the same AIS channel, but 0.03 to 0.19 seconds apart. I checked another receiver and it sees the same results, so it's not a receiver having hardware issues. Just from looking at the encoded text, I can see that it is the same vessel (the MMSI is not changing) putting out both ITDMA (msg 3) and SOTDMA (msg 1). e.g. If anyone is able to find out what type of AIS unit the Thor Alliance, I would really appreciate hearing from you. I am very curious to know why this ship's AIS is violating the ITU 1371-3 specification for transmissions. Or is it's working fine, then there is something in the data collection hardware or software. This post is about post-processing AIS logs. I've been thinking through the process of removing duplicate receive messages for the situate where I've got multiple receivers with partially overlapping coverage and vessels are transiting across the area. My first thought was to use time slices. If I know when the messages went out, then I should be able to get just look at time window and remove other packets from that vessel at that time. However, if timestamping isn't completely accurate, this method breaks down. Turns out that there should be a simpler method to decimating packets. If I totally ignore the metadata and just use the NMEA data payload text fields as a hash, I should be able to see if I have already passed through a packet with that hash and drop it if it's already come through. I see two risks with this method. First, the table of hashes has to be bound. If I need to keep 5 million hashes around and search this set for each new packet, the decimation process is going to get very slow. It should be possible to calculate a reasonable FIFO length of hashes based on the number of stations reporting AIS data. 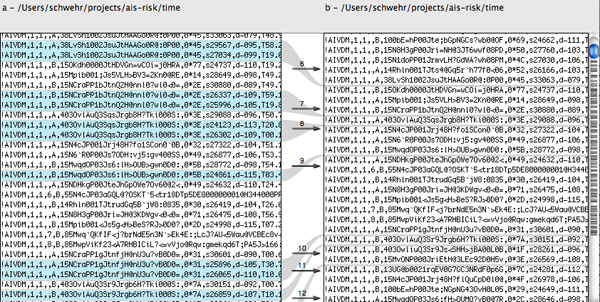 When a new packet comes in and the queue gets longer than the maximum number of hashes, we simply drop the oldest hash. If necessary, this can be augmented to be a FIFO for each message number to speed up the searching. The second problem is a little more trouble. What if we get two messages with the same hash that are really are at different times? 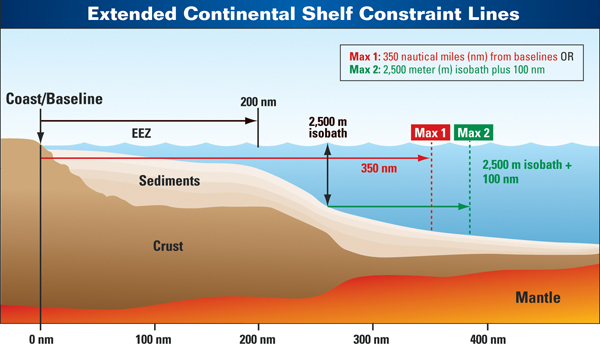 This can happen with vessels that are working in a constrained area, e.g. operating in dynamic positioning (DP) mode or tied to a dock. 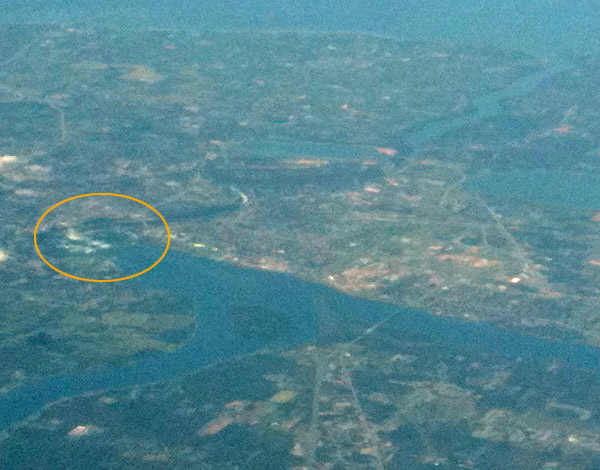 With the LNG construction off of Boston, is is possible to get repeats of the position. However, it takes more than a repeat in the longitude and latitude. The ROT, SOG, heading, and commstate all have to be these same. These fields are likely changing, although there should be lots of repeats in commstate for SOTDMA. ITDMA position messages will not have as much variation in the commstate as SOTDMA, but these packets are less common. One strategy would be to track the receive station with the hash and emit the new message if it is a repeat of that heard from the same station. The hash strategy should work for most packets, but may have undesired results for tracking repeating notices where the content is the same (e.g. right whale notices where the buoy status has not changed). If I felt that I could trust time, some of these issues would go away. Running this on 262000 messages from 3 receivers in the Boston approaches dropped 89000 messages (34%). Here is OpenDiff showing the change from the original (on the left) to the version without the duplicates on the right. I didn't know until yesterday that the EPA has an ocean going research vessel: Ocean Survey Vessel (OSV) Bold - I'd call is either S/V or R/V, but that's just me. 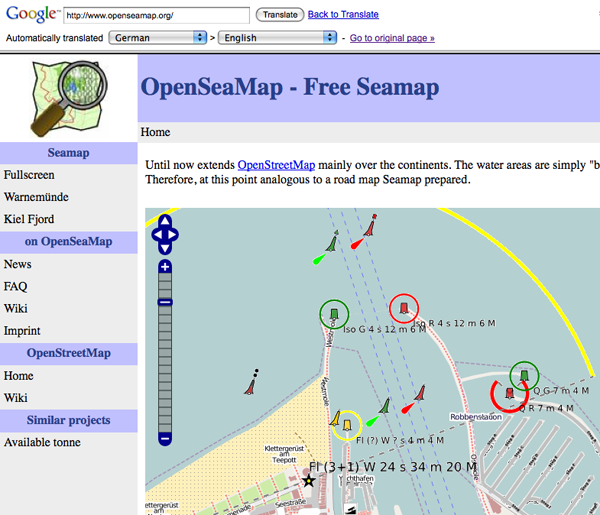 OpenSeaMap looks to do the same as OpenStreetMap but for nautical charts. This is less important in the United States where NOAA releases charts for free, but even in the US, this could have interesting uses. Here is a screen shot. This English is a bit strange because the original is German and automatic translaters are only so good.